Was 2018 The Year Of The Transfer In The Big 12? Looking over the good, the bad, and the ugly from week two in the Big 12. The second week of Big 12 play is now behind us and the week two out of conference games had plenty of Good, Bad, and Ugly. Oklahoma’s Running Game After Anderson’s Injury – Rodney Anderson suffered a serious knee injury against UCLA on Sunday, and is out for the season. Losing a top-5, game-changing running back would be curtains for most team’s season aspirations. Oklahoma isn’t most teams, though. Kyler Murray can tuck it and run, and already proven he’s one of the best dual threat quarterbacks in the country. Trey Sermon, though is outing on Saturday wasn’t very inspiring, is the other half of the best one-two punch in the Big 12. There’s also T.J Pledger, who gained 6.4 yards per carry vs UCLA. Marcelias Sutton also averaged 6.6 yards per carry. Plus, the Oklahoma offensive line is elite as well. Any running back is put in a position to succeed when running behind Dru Samia, Ben Powers and Bobby Evans. There is no doubt that Anderson is an elite running back, but the Sooners should be just fine on the ground this season. West Virginia’s Running Back By Committee – The current setup in the backfield looks to be working just fine for Jake Spavitals’ offense. When Justin Crawford left for the NFL, West Virginia had a hole to fill at running back. Most assumed Kennedy McKoy was the answer, and were shocked to see Martell Pettaway get most of the carries while McKoy did not play until the third quarter versus Tennessee. In week two, the Mountaineers hosted Youngstown State and used McKoy and Pettaway along with true freshmen Leddie Brown and Alec Sinkfield. Those four combined for 292 yards on 43 carries for a 6.8 yards per carry average with McKoy, Sinkfield, and Brown collecting touchdowns. Leddie Brown had 15 carries for 115 yards and has emerged as the premiere back for the Mountaineers. But that won’t stop the rest of this committee from getting carries. Everyone knew WVU’s pass game was going to be electric but through two weeks it seems the running game can be as well. Kansas’s 2018 Road Record – On the road this season, Kansas is 1-0, in their previous 46 road games they were 0-46. The Jayhawks come back to Lawrence with a win for the first time since September 9, 2009. That’s 9 years without a road win. Pooka Williams ran the ball all over Central Michigan’s defense and tallied two scores with 125 yards. The Jayhawk defense forced 6 turnovers and returned an interception for a touchdown in route to a 31-7 victory. This doesn’t mean Kansas will win another game this season, but a home game with an equally as disgraceful Rutgers on Saturday leaves a 2-1 possibility heading into Big 12 play. Texas Tech’s Defense – The Red Raider defense pitched a shutout vs the visiting Lamar Cardinals. Now, Lamar is no Big 12 offense by any stretch of the imagination, but for the Red Raiders to look as good on defense as they did on Saturday is a very encouraging sign. Lamar totaled just 182 yards and was 2/16 on third down. After giving up 47 points and what felt like a mile in yards to Ole Miss in week one, the Texas Tech defense was lights out on week two. If the Red Raiders want to be playing in late December they are going to need a much improved defense, and there were glimpses of that on Saturday. TCU’s Passing Attack – When the Horned Frogs tried to throw the ball on Friday, it was a complete mess. You’d never know from the score, a 42-12 win over SMU, but Shawn Robinson struggled to get going all night and he ended up completing 15 of his 28 passes for 146 yards. He found paydirt once and threw one interception. I’m sure the weather had an effect on his performance, but the whole TCU team took a quarter or so to wake up after trailing 9-0. KaVontae Turpin and Jalen Reagor were the only receivers with over 20 yards receiving. Other than the pass game the Horned Frogs played good enough to win by 30 on the road. If TCU wants to compete for a Big 12 championship they need to start passing the ball better. The Texas Longhorns – They did get back in the win column on Saturday, but it wasn’t pretty. The Longhorns hosted Tulsa and slugged their way to a 28-21 win. Sam Ehlinger looked very good completing 21 of his 27 attempts for 237 yards and two touchdowns. The offense as a whole looked solid, not allowing any sacks or quarterback hurries and 5.1 yards per carry. The defense struggled to create pressure all game. Tulsa gave up zero sacks, and only two quarterback hurries. Texas, number wise, looked like they should have won by a lot more than seven, but a single possession win at home against Tulsa, after an embarrassing loss to Maryland, is not exactly the start the Longhorns wanted. Kansas State’s Start To 2018 – Kansas State’s first two weeks was about as bad as it could be. After beating FCS South Dakota by the skin of their teeth, 18th ranked Mississippi State came to the “little apple” and handled the Wildcats pretty easily. K-State was a combined 9 of 21 passing the ball for just 100 yards, but the offense as a whole struggled to move the ball. However, the defense wasn’t much better. They only registered one tackle for a loss, and let Kylin Hill run all over them with 211 yards and two touchdowns; averaging 12.4 yards per carry. The weather did more to hold Nick Fitzgerald in check as the Bulldogs won by 21 on the road. Kansas State needs to turn a lot of things around or it’s going to be a embarrassing season for them. Iowa State’s Offense – The Cyclones did not look good on Saturday in Iowa City. They only put up three points against their in-state rival, the Iowa Hawkeyes. Yes, the Hawkeyes have a great defense and have built a program around that defense, but Iowa State could not move the ball on the ground at all and didn’t look much better in the passing game. Star running back David Montgomery was kept in check all day and averaged just 2.6 yards per carry. As a team, the Cyclones averaged 0.8 yards per carry. Not ideal. Kyle Kempt had 15 completions on 21 pass attempts. Good, right? Unfortunately, most of them went nowhere as he averaged just six yards an attempt. Then things got worse. When Kempt suffered an injury and Zeb Noland came in, he didn’t even have the completions, let alone the yards. The defense for Iowa State played well. In fact, they played great. However, they can only bend for so long before breaking. 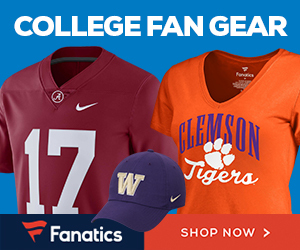 We are excited to partner with Fanatics this football season. 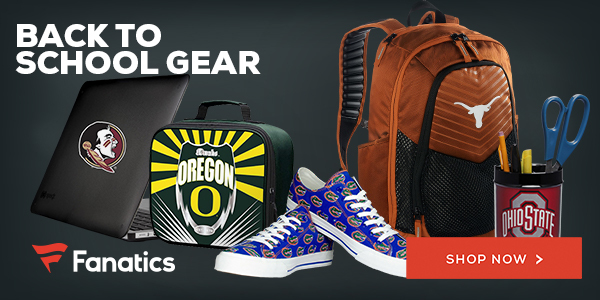 They have the latest, hottest and officially licensed, team gear. Everything from shirts, hats and pants to golf club headcovers, flags and collectible memorabilia. Get the gear other fans will drool over on game day!